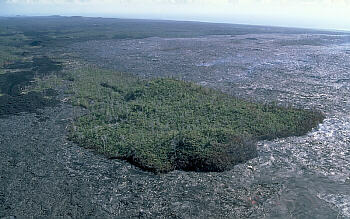 This kipuka formed during the Pu'u O'o-Kupaianaha eruption on the east rift zone of Kilauea Volcano, Hawaii. Credit: J. D. Griggs / U.S. Geological Survey. 'Kipuka' is a Hawaiian term for an 'island' of land completely surrounded by one or more younger lava flows. A kipuka forms when lava encircles a hill or a slight rise in the ground as it moves downslope or across relatively flat ground. Because they are surrounded by more recent flows, kipukas are often covered with mature vegetation. The word kipuka is a variation of the Hawaiian word puka which means hole. Puka-shell necklaces, popular with tourists, are made with small shells which have holes worn in the center by wave action on sandy beaches.